Over the last couple of centuries, wedding dresses have mutated, Godzilla-like, from a gown worn while saying vows to the centerpiece of a huge industry. If you're curious how that happened—and, more importantly, keen to gawk at some really luxe examples of the form—there's a new museum exhibit devoted to the topic. 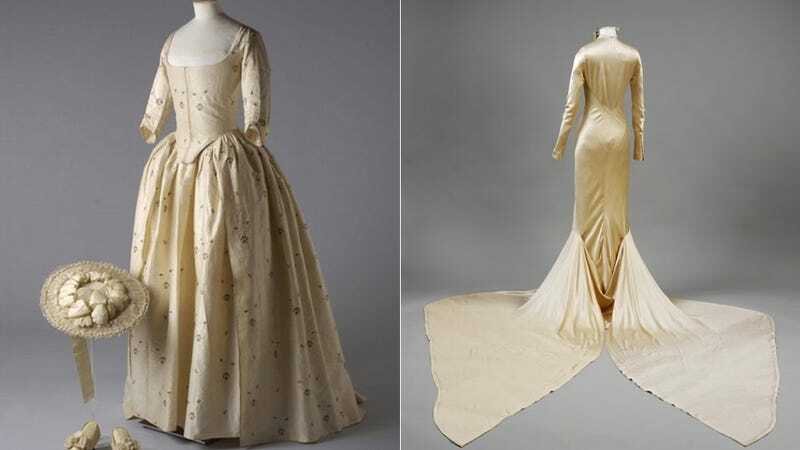 The rather obviously named "Wedding Dresses 1775 - 2014" opens May 3, at London's Victoria and Albert Museum. Designers featured run the gamut from Charles Frederick Worth to Vivienne Westwood, but the exhibit also includes examples from the days before brand names (imagine that!). According to the Telegraph, there are 80 dresses all told, including the gowns of Gwen Stefani and Camilla Parker-Bowles, now the Duchess of Cornwall. "They were worn to court or otherwise as formal wear," she says. "Material was too expensive to be wear only once." The same applies to some of the striking wartime and austerity-era dresses in the exhibition - a modest world away from the rivulets of wear-once nuptial overkill that peak in the Eighties vitrine. Perhaps the most ingenious double-function dress on show is this floral-sprigged cream silk dress ordered by Eliza Larken for her wedding to William (later 6th Baron) Monson in 1828. Her great wedding day reform was to have a dress with long, detachable sleeves, secured by hook-and-eye. Imagine that—sleeves on a wedding dress. The exhibit runs until March 2015; more eye candy below! Photos courtesy the Victoria and Albert Museum, London.